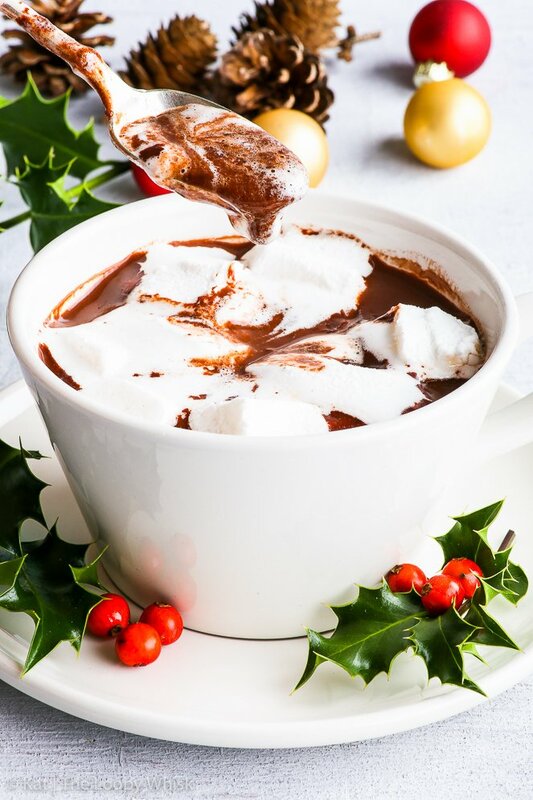 This homemade hot chocolate mix makes the most delicious, decadent, luscious hot chocolate. It’s definitely a go-to on a cold, dreary day – after all, homemade hot chocolate is the ultimate comfort drink. It’s been a long day, friends. A long day in a series of long days. You know what would make this long day a whole lot better? A blanket nest, a good book and, of course, hot chocolate. 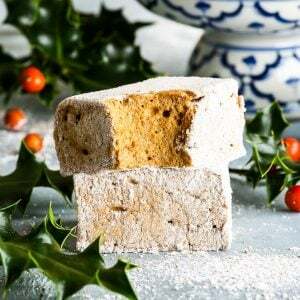 With some homemade marshmallows. Now doesn’t that just sound… heavenly. Words are tricky today (it happens), but… it’s a homemade hot chocolate mix, ‘kay? You know it’s gonna be delicious. 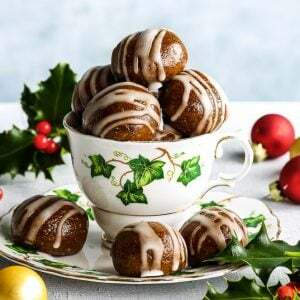 There’s cocoa powder, cornstarch (arrowroot powder works too), powdered sugar (or coconut sugar if you’re taking the refined sugar free route), a pinch of salt and cinnamon – for the wintery and/or Christmassy vibes. With ingredients like these… only good things can happen. 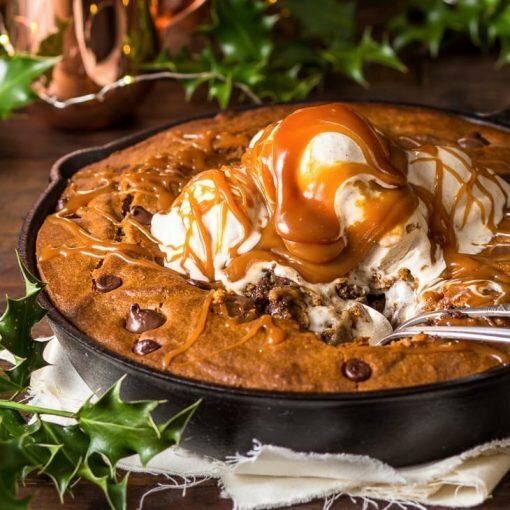 We’ll mix everything up (trying not to cover ourselves in cocoa powder… we won’t succeed) and – that’s it. It’s a non-recipe recipe. When the hot chocolate craving strikes, all you need to do is put a few table spoons of the homemade hot chocolate mix into milk (dairy or non-dairy, your call) and cook it until it’s lovely and thick. Not too thick, obviously, that’s chocolate pudding territory. Because we’re badass we’ll also throw in a few pieces of dark chocolate. 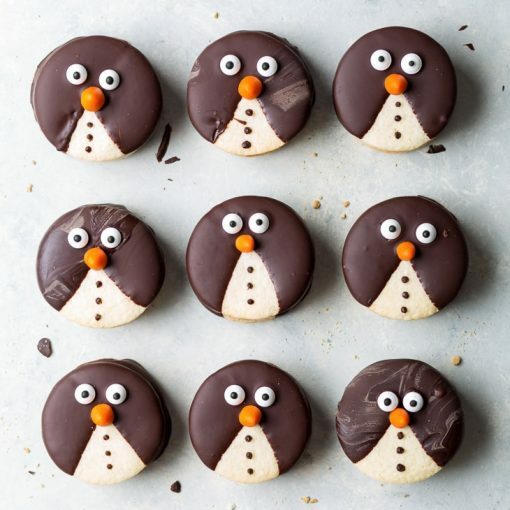 And then a few more, because… chocolate. Duh. Then we’ll pour the sweet, luscious, chocolatey deliciousness into a mug (smells so good!) 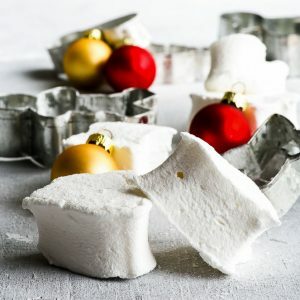 and plop in a few homemade marshmallows. Let them melt a bit. Have a cookie. Relax. 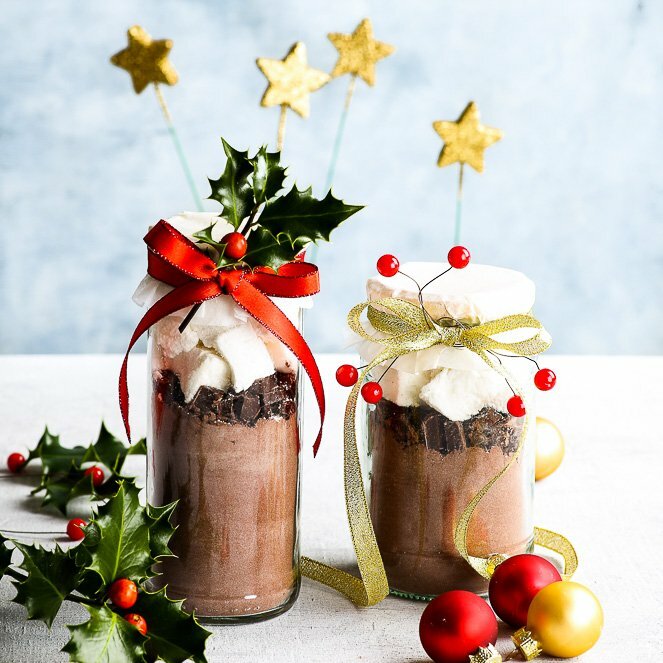 You’ve made your own homemade hot chocolate mix – be proud of yourself. And with the homemade hot chocolate in hand… the long day doesn’t seem quite as bad anymore. 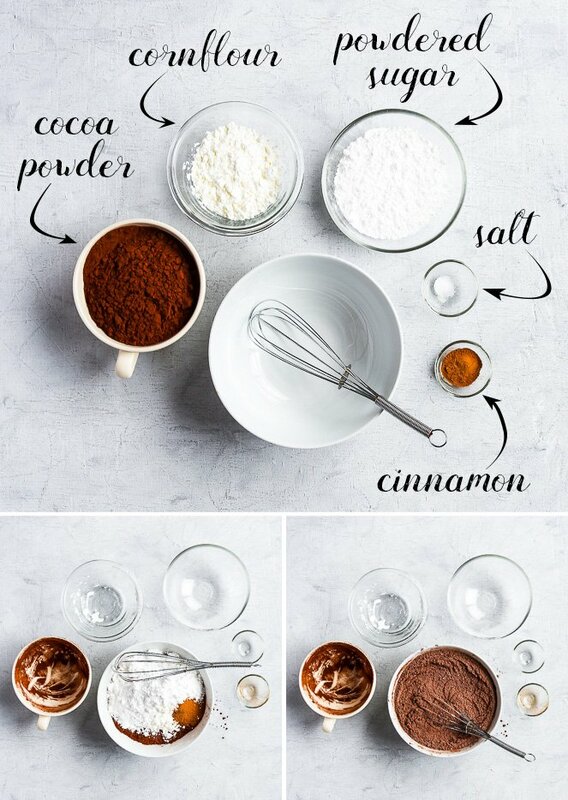 Mix all hot chocolate mix ingredients together. The hot chocolate mix keeps well in a closed container in a cool dry place for about 3 - 4 weeks. 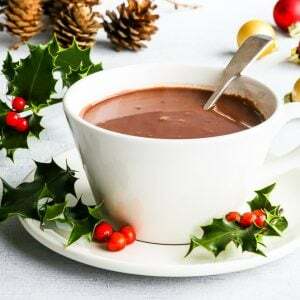 To make a homemade hot chocolate (1 serving / about 1 cup), add 1/4 cup of the hot chocolate mix to a saucepan (make sure you get plenty of the chopped dark chocolate, as well!). Add 1/4 cup of milk of choice (dairy or non-dairy) and mix it with the hot chocolate mix into a paste. Add an additional 3/4 cup of the milk and stir it well. 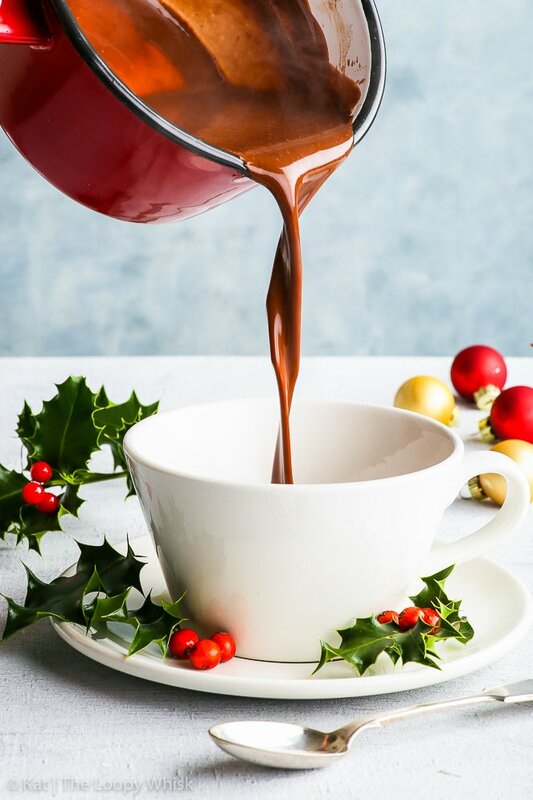 Cook the hot chocolate mixture on medium-high heat with constant stirring until it thickens to the desired consistency (about 5 - 10 minutes). If you want a thicker hot chocolate, just add more hot chocolate mix! Looking for more Christmassy deliciousness? Look no further! 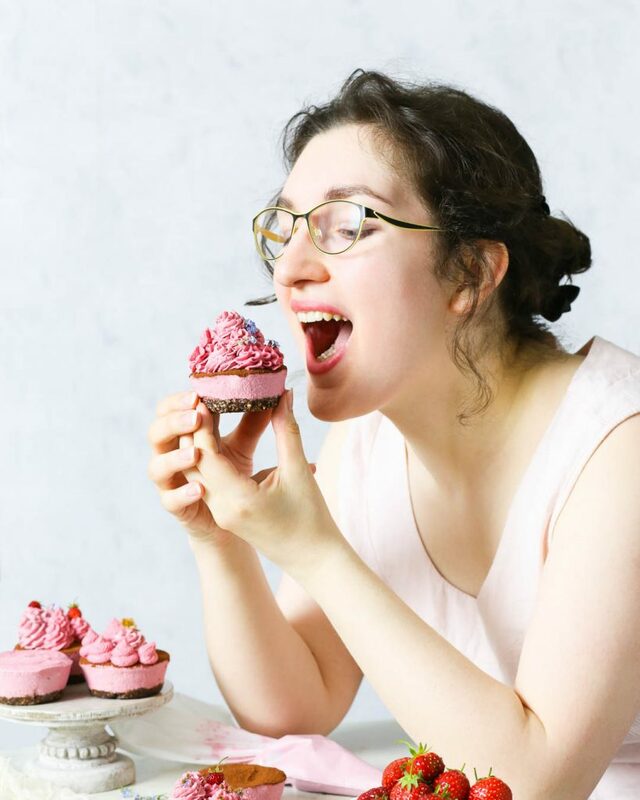 What is the cornstarch for in this recipe? Will it be fine if that’s omitted? 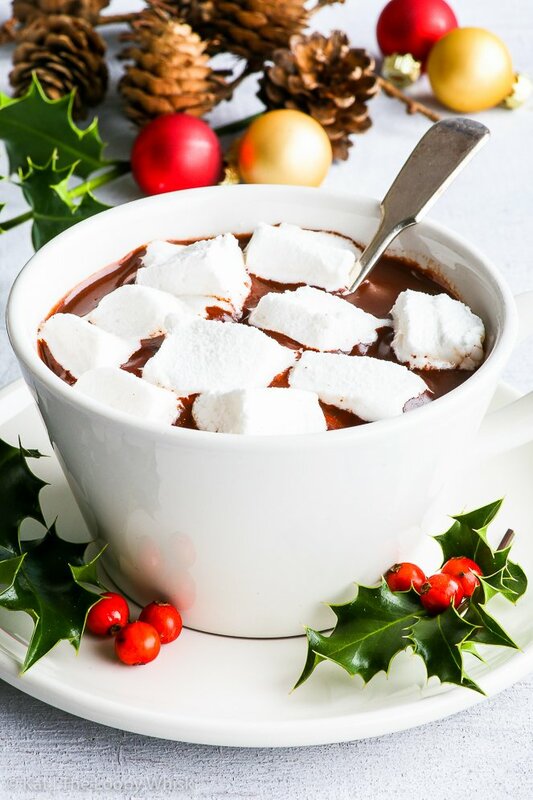 The cornstarch makes sure the chocolate is thick and luxurious – if you omit it, you’ll get hot cocoa (which is still delicious). You can substitute the cornstarch with arrowroot powder.